Whatever obstacles they face, the question facing workers is: what can they do to save or save more? The dramatic drop in the price of gas, a major component of most families’ spending, is the perfect opportunity to direct the savings from low gas prices to funding retirement. As my university students discovered, you can open an IRA with as little as $100 with Schwab. The total stock index fund is a good choice. 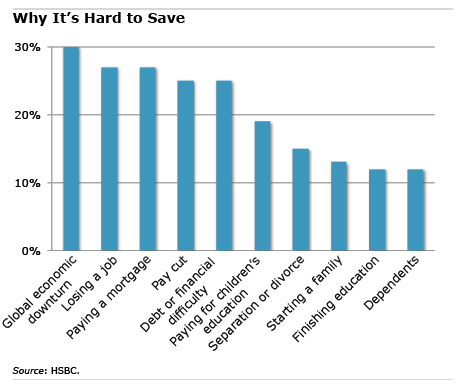 I wonder how much is reluctance to take the risks involved in saving today. My parents weren’t covered by pensions, and I remember how they saved for retirement with savings bonds. If I remember, you’d have money withheld from your wages, get the bonds in the mail and put them in your safe deposit box at the bank. They were a sure thing and paid real interest. Now there’s no such thing as real interest. If you want to save, you have to risk your principal. Maybe people are afraid of doing that. Granted, they have no choice if they want a secure retirement, but psychology is everything. By moving employees off of a pension, retirement has become an optional expense and our society (and education) hasn’t yet adapted. People should not be purchasing houses if they can’t also afford to contribute to their retirement. Paying for a child’s private school should not usurp retirement savings. It doesn’t help that there’s been a drop in wages for lower and middle class people, but those individuals still need to save for retirement. Our society and income distribution does not make it easy. Those making over $100K are making excuses (or unwise choices). I like Jean’s comment above and the point is well taken. But I want to add that I keep an extremely detailed record/budget of all household spending. Though my family saved over $150 in diesel costs for our vehicle in January 2015, our insurance went up nearly $100 and then our electric rate went up, too. We have a small amount of savings from this momentary price dip in gas prices, but for the long-term health care inflation and overarching inflationary pressures for goods continue to erode our excess cash flow, which we could use for retirement savings. Watching my budget so carefully makes it evident to me that one serious health care problem could destroy our financial balance. We carry no debt, and avoid excess spending, but one hospital bill could trigger a number of problems…despite diligent savings. I think many prudent household planners see a similar problem in financial security. It’s clear from these comments that it’s not always fair to say people are just making excuses. Unfortunately, however, they may still have regrets in retirement. We appreciate all of our readers’ insights. I am 73 and still working as a public school teacher. I will retire next year. I am retiring late because of life circumstances and mistakes I made in not realizing how close retirement was until age 65. At that point I maxed my 403b, 457b, and other savings, and I waited until full retirement age to collect Social Security. So while I have only been saving for about 10 years, I will be able to retire comfortably, god-willing, with frugal and intelligent spending. I do not own a house and I will rent in retirement. My advice: save, save, save. I am still able to help grandchildren. I did not receive any inheritance because I lost my parents early. Some people rely on inheritance. It is better to rely on your own employments and your own efforts.